A taxable person can apply to the commissioner under Section 80 of CGST Act for extension of time for payment of GST, Interest, Penalty or any amount under GST. The taxable person can also apply for payment in instalments. The main condition is that such GST or other amount should not be the amount due as per the liability self-assessed in any return. Therefore, the onlyamount which is payable due to a demand notice can be deferred or paid in instalments. The number of instalments cannot be more than twentyfour and the person is also liable to pay interest at the rate of 18% under Section 50 of CGST Act. If the person makes adefault in the payment of such instalment on its due date, the whole outstanding amount becomes payable on the date of default. Taxable person has already defaulted on the payment of any amount for which the recovery process is on. Taxable person has not been allowed to make payment in instalments in the preceding financial year. The amount for which instalment facility is sought is less than twenty–five thousand rupees. Form GST DRC-20 is required to be filed for applying under section 80. On receiving an application,the Commissioner shall call for a report from the jurisdictional officer about the financial ability of the taxable person to pay the said amount. Considering the report of the jurisdictional officer, the Commissioner may issue an order in FORM GST DRC- 21 allowing the taxable person further time to make payment or to pay the amount in such monthly instalments, not exceeding twenty-four, as he may deem fit. Step 2: Go to form GST DRC-20. There is two way to open the form. 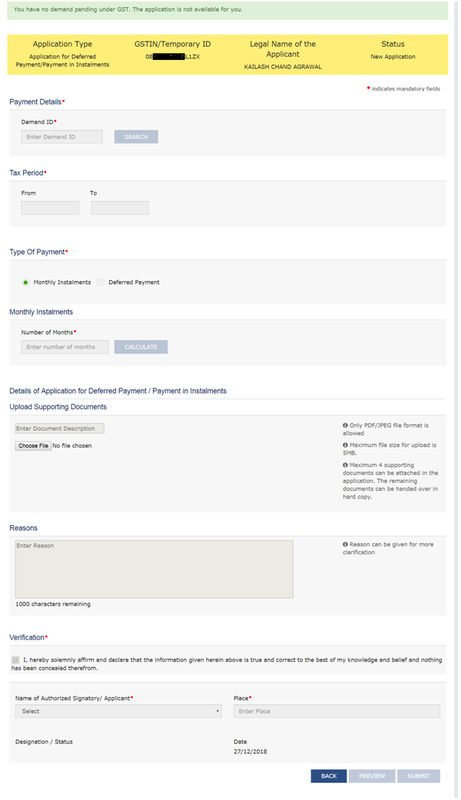 Method 2 – Go to Services >> User Services >> My Applications and then select Application for Deferred Payment/Payment in Instalment and click on New Application button. Step 3: Fill the Demand Id in the box if you do not have any demand outstanding, then a message will come in the top as in below image. Step 4: Fill in your Demand ID. Tax period will be automatically filled. Select whether you want to defer the payment or pay in instalments. If instalment option is selected then enter number of instalment in which you want to pay. If the Deferred Payment option is selected, the taxpayer has to select the appropriate ‘Due date of payment from the calendar. Upload supporting documents if any and file the form. ARN will be generated and will be sent to your email and SMS. You can check the status of the application by going to Services >> User Services >> My applications.